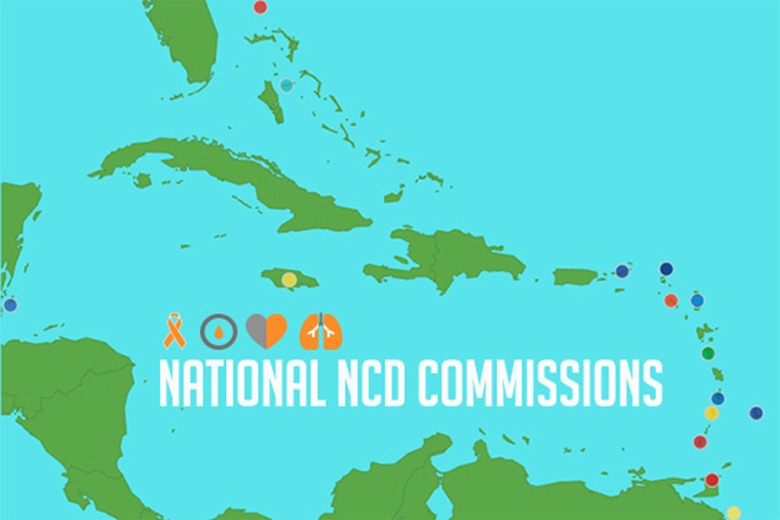 To facilitate communication between National NCD Commissions in CARICOM. To provide a platform for ongoing sharing of experiences and lessons learned. To provide a platform for addressing challenges unique to NNCDCs including resource limitations (technical and financial). To explore strategies to strengthen the capacity of NNCDCS to contribute meaningfully towards the achievement of national NCD targets in support of achieving the mandates of the Port of Spain Declaration, the 2025 global NCD goals and the SDGs. To explore strategies to improve sustainability of NNCDCs. To provide a platform for collective NNCDC action in the region. The inaugural meeting chaired by Sir Trevor Hassell, Chair of the Barbados NNCDC was attended by Chairs from 6 Commissions: Dr. Leslie Walwyn (Antigua & Barbuda); Dr. Virloy Lewin and Dr. Cheryl Peek-Ball (Bermuda); Dr. Phillip Swann (The Bahamas); Dr. Damian Greaves and Dr. Sonia Nixon (Grenada); and Dr. Owen Gabriel (St. Lucia). The initiative was regarded as a valuable opportunity to learn and ultimately improve the functioning of NNCDCs in the Caribbean. Updates on the activities of the network will be shared in the roundup and our soon to be launched NNCDC online portal.